We are trying out a different sort of schedule with my kids lately... at least on days when things are a little more flexible. Earlier this week I introduced a paper plate menu schedule to my preschooler and 1st grader. They thought it was really neat and the part about it that they liked the most is that it gave them some control over our schedule. I think I've mentioned before that I am working on finding ways to give my kids more positive power so that we avoid power struggles. 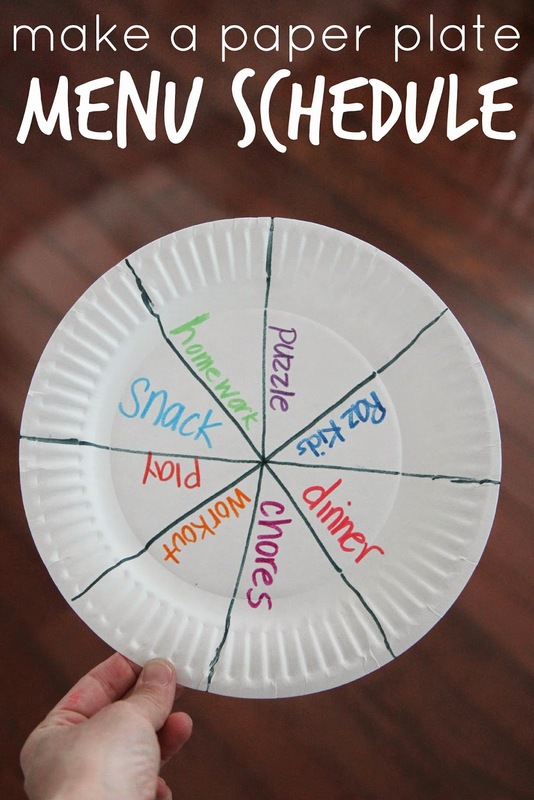 This paper plate menu schedule allows the kids to choose the order of their afternoon activities... while I choose what we do. The reason this is called a menu schedule is because kids get to choose what they do that is on the schedule... like as if they were ordering off a menu. A few days a week we have nothing scheduled in the afternoons other than the typical eat dinner, do homework, and get ready for bed sort of schedule. Although I like the kids to have lots of free time to play and have fun and relax sometimes what ends up happening is grumpiness and overtiredness from a busy day at school that leads to the inability to decide what to do... and frustration! On the afternoons when the kids are more exhausted I try and have a paper plate menu schedule ready for them. The schedule is very flexibile but I write each activity for the afternoon on the paper plate pie chart-like schedule. I explain to the kids that their job is to do each activity and then put a sticker next to each activity on their menu schedule before bedtime at 7:45pm. The catch is that I don't tell them the order for the schedule... although if we want to go to the park then I will mention what time it gets dark so we make sure we do that early. I sometimes will also tell them that the favorite activity will go last. My preschooler and 1st grader enjoy working together to decide the schedule and check things off with stickers. When I get a moment sometime soon I will also add a photo of the picture schedule version for my preschooler. Although she is learning to recognize words, I like to add little tiny hand-drawn scribbled pictures next to each word on her paper plate schedule so that she can remember what each thing says. If you try out this schedule, one thing to remember is to actually let the kids be in control... and be prepared that dinner might fall at the end or you might be eating it really early in the afternoon. I thought it was really fun to give up all control and let the kids guide the day a bit more than usual. Along with this schedule I do implement some simple consequences that help motivate my kids to actually complete each item on their schedule. After they complete all of the activities we get to do something fun together before bed (or sometimes they will even add the fun activity onto their schedule at the end). If they don't complete all of the items on their schedule before the time is up, we have to skip doing our fun activity. I try not to remind the kids or nag them too much while they are doing the activities, but I do enforce bedtime. I think giving kids the opportunity to organize their time and plan out their schedules is really important and such a great life skill. As an adult I feel like I am always looking at my "to do" list trying to prioritize and order things to work the best. Teaching kids to prioritize and plan their time (with adult guidance and help) is a great thing to start at early ages! Do you let your kids plan out their own schedule? Do you have a visual schedule of any type at your house? How do you encourage kids to get things done without engaging in power struggles?